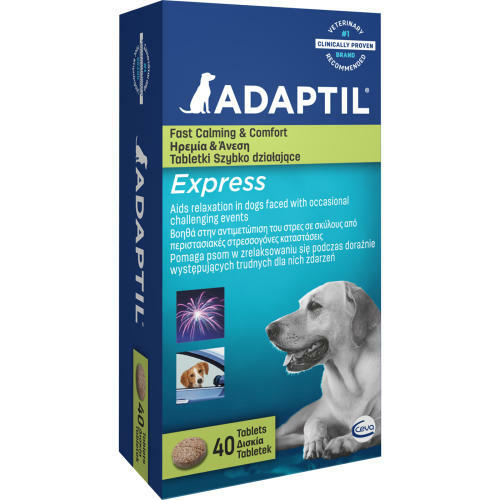 Adaptil Express (formerly Stress Relief Now) tablets are a simple and fast way to calm your dog in stressful situations. Based on natural ingredients, the non-pheromone tablets are an ideal way for you to support your dog during such stressful short term occasional events as house parties, fireworks on bonfire night, thunderstorms, travelling on car trips, or visits to the vets. The active ingredients in Adaptil Express tablets are an expertly balanced combination of GABA, L-trpyophan, L-theanine and B- vitamins, which work effectively together to provide fast and temporary relief.